A great blue heron, left, wades in shallow water. At right, great blue herons nest in a tree at Mill Pond. A sure sign of spring, Westborough's nesting herons are back at Mill Pond, although this year there are noticeably fewer nests than in the past. From the shore, it's easy to spot the large nests made of sticks and the herons perched on them. Bring binoculars for an even better view. Time may be running out for the nesting site at Mill Pond. The birds return year after year to repair their nests and re-use them, but our New England weather has gradually been taking down the dead trees that hold the nests. Each spring there are fewer big branches and fewer trees left standing. Someday soon those all-important stumps will be gone from Stump Pond, as Mill Pond used to be called because of its dead trees. Enjoy watching the nesting herons while you still can. Great blue heron pairs share duties at the nest. Both the male and the female sit on the nest to keep the eggs warm. Once the chicks hatch, both parents hunt for food and feed them. Great blue herons are relatively common throughout Massachusetts. They are attracted to Westborough for its ponds, streams, and many swamps. These watery places make good hunting grounds for them. Keep an eye out for great blue herons along the shores of ponds and rivers throughout the spring and summer. You might see one as it hunts by wading in shallow waters. It slowly stalks its prey or remains motionless for long periods, waiting for a fish or frog to swim near. Then it strikes, seizing its prey in its long yellow bill. 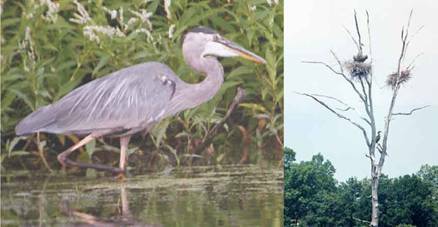 You might catch sight of a great blue heron--or a pair of them--flying across open water at Mill Pond or the Westborough Reservoir (Sandra Pond). They have wing spans up to seven feet. Their flight is distinctive. They fly with their long necks folded back in an S shape, not outstretched. Their long legs trail behind them. The name "great blue heron" is easy to explain. With their long legs and necks, they stand about 4 feet high. They can weigh 6 to 12 pounds. Their backs are grey-blue, the color of slate.